A Washington lobbyist embarks on a seemingly unwinnable battle for gun control legislation. 'Sorkinesque' is a label that's now applied to any movie or TV show set in a political or corporate realm and which features fast-talking characters walking endlessly through corridors of power. 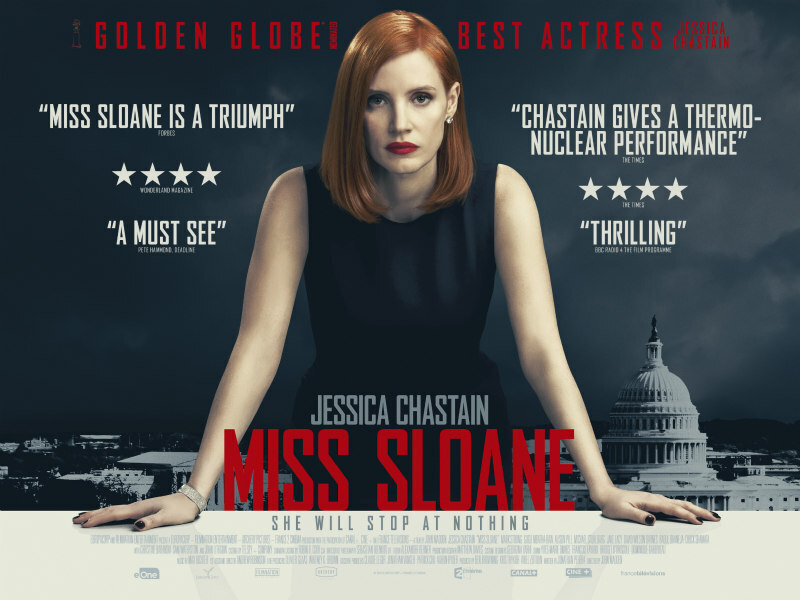 On the surface, director John Madden's Washington set drama Miss Sloane would seem to fit such a designation. It takes place at the epicentre of America's political playground and boasts more words per minute than the most highly skilled typist could keep up with. But it lacks the heart and depth of Sorkin's best work; sure, it walks and talks like a Sorkin piece, but crucially, it never feels like one. The eponymous Miss Sloane, played by a firebrand Jessica Chastain, is a Washington lobbyist who has spent her career focussed solely on winning, regardless of her personal views on the campaigns her firm works on. This all changes when a National Rifle Association client asks her to come up with a way of appealing to the largely artillery free women of America. Suddenly Sloane appears to develop a conscience, upping sticks and taking half of her staff with her - Jerry Maguire style, as the film itself remarks - to run a campaign for an opposing gun control lobby firm led by Rodolfo Schmidt (a wasted Mark Strong). You don't have to live in the U.S. to know the scale of the battle taken on by Sloane. As American as Apple Pie, guns aren't leaving the U.S. any time soon, but as this is essentially a fantasy film, we're led to believe our anti-hero just might pull it off. A shame then that Sloane is such a poorly sketched figure. Despite a committed performance from Chastain that elevates the weak material, our protagonist at best comes off as some Katherine Hepburn robot constructed by bored MIT students. The film gives us a few glimpses into Sloane's character - she's addicted to uppers and enjoys the company of male escorts - but never into her soul. She's a heartless, cybernetic lobbyist, as though one of the fembots from The Bionic Woman has infiltrated leftist American politics. She makes enormous personal sacrifices that simply aren't plausible for someone who claims to care solely about success. Is there a personal motive behind Sloane's determination to effect change in this sphere? Or is she simply so altruistic that she's willing to destroy her own life to save thousands of others? The script never tells us, and don't expect an answer from looking into Sloane's eyes - there's nothing behind them. Miss Sloane is in UK/ROI cinemas May 12th.